So here I am in the midst of apple week and I have a special dedication to today’s post. Do you all know Jen from My Kitchen Addiction? Guess what? She’s having a baby girl!! And today a bunch of us bloggers are throwing her a virtual baby shower. Thanks to Amber from Bluebonnets and Brownies and Tracy from Sugarcrafter for organizing this! And I’m here. In the middle of apple week. What to make for a virtual baby shower? Can’t very well do a cute little cupcake….When it hit me. Babies…the apples of our eye. Get it? Yes? She hosts a monthy kitchen bootcamp on her blog. 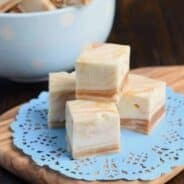 She gives a challenge, people submit their recipes, and she does a little roundup of some of the great stuff. Guess who submitted a recipe (with an AWFUL photo)? So sweet of her to feature me like that! I think back then I wasn’t even officially a food blog, and only my family was reading…. I’m pretty sure my family has stopped reading at this point. So. CONGRATS JEN on your little apple! Hey. you could name her Apple. I hear all the cool kids are doing that. Just sayin…. I wish you all the love and joy that holding a sweet baby brings! May you and your husband be blessed! If you haven’t entered the giveaway for all the Crunchpak Swag and extra goodies, click HERE!! 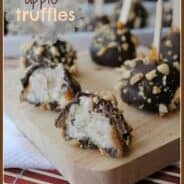 Caramel Apple Truffles are amazing. The center is filled with a homemade apple pie truffle filling (took me three tries to get this baby right)! Then it’s coated in caramel, chocolate and peanuts. I had several people who tried these say they are the best thing ever…I have to agree! These little truffles here are a lot of work. I’m not going to lie. To clarify, it’s not hard work, just quite a few steps. But let me tell you they are so worth every step! Plus this recipe makes about 72 truffles. AND you can freeze them. So make them, freeze them, and eat one a day for the next 72 days. Or something like that…. Check out all the other participants in the Baby Shower here…. Don’t forget to follow along on our Applicious Goodies Pinterest Board!! Begin by mixing sugar, cream and butter in medium saucepan over medium-high heat. Stirring constantly, bring mixture to a boil. Continue to boil for 4 FULL minutes, stirring constantly. Pour hot mixture into large freezer-safe mixing bowl. Add white chocolate, marshmallow, cinnamon, nutmeg, allspice and apples. Mix until chocolate is completely melted (about 2 minutes). Freeze bowl for about 2 hours (or refrigerate overnight). Scoop mixture into 1 1/2 inch balls on a large parchment paper lined cookie sheet. Stick a small popsicle stick (I found the mini sized ones at Michaels, about 2 inch) Refreeze for 2 hours. Don’t worry if they are misshapen. 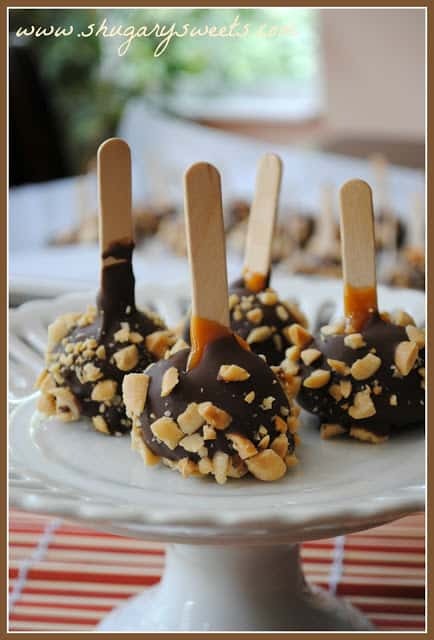 After this second freeze you can reform them into balls before dipping in caramel. In large microwave safe bowl, add unwrapped caramels and water. Microwave on high for 2 1/2 minutes, stirring after each 30 second interval. Dip each truffle in melted caramel, twisting and tapping until excess drips off. After dipping about a dozen, go back to the dipped ones and re-shape with your hands, pressing the caramel back into a ball shape. Freeze immediately! If truffles get too soft to dip in caramel, stick back in the freezer for 15 minutes. Go change your load of laundry. Have a snack. Then do the next dozen. Once all truffles are dipped in caramel and in the freezer, melt your chocolate according to package directions. Pour melted chocolate in a bowl. Have your bowl of chopped peanuts next to it. Take your frozen truffles and dip in melted chocolate, tapping a couple times to remove excess chocolate. Sprinkle immediately with peanuts and return to parchment paper. Continue until all truffles have been dipped. Now eat 2 as your reward. You deserve it! 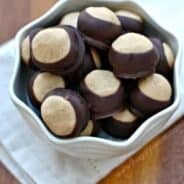 Store truffles in refrigerator. OR, if you’re not going to be using within several days, place truffles in freezer safe container or ziploc bag and freeze. Return to refrigerator to thaw for an hour before eating! So sweet!! These look amazing too, perfect hand-held treats for a shower! For Real!! 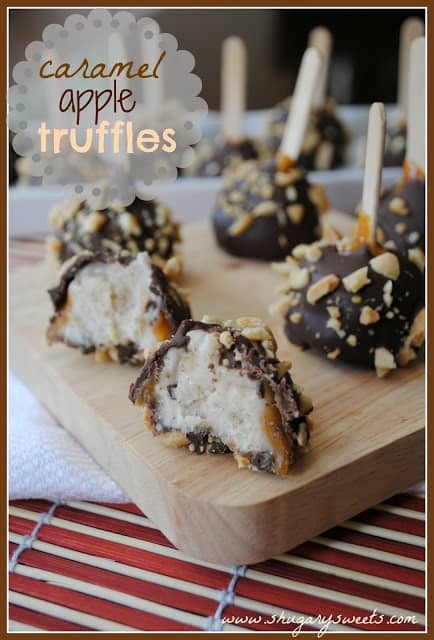 Chocolate and Caramel apples are awesome! Thank you so much for your sweet post… And I’m so glad that we discovered each other through Kitchen Bootcamp!! 🙂 I am lucky to have so many great friends! Congrats Jen! you deserve all the love and support today! oh my gosh – these sound sinfully amazing… I could really use one right now. Those are absolutely adorable! I’ll take a dozen please! 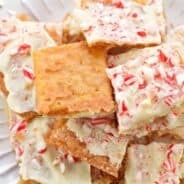 These look so delicious, I am pinning to make for later thanks for sharing! YUM. Those look SO good. I love baby showers. And I love blog baby showers too! These looks SO incredible!!!! Maybe my favorite apple recipe I’ve seen this week!! YUM! These truffles look so good. Ya know I think candy making is your forte. Apple, chocolate, truffles… Dam these look good!!! These look they are worth every step! These are absolutely gorgeous! Thank you for bringing them along to Jen’s virtual shower. They definitely look worth every step and I know I will be trying them soon!! wow, i would devour so many of those like there’s no tomorrow. I made these and they never set up enough to roll into balls. I put them in the freezer and they still were too sticky, so finally I just lined a glass dish with waxed paper and poured them in covered with some melted caramel and chocolate. They taste really good but just never set, don’t know what I did wrong? Would love to master the technique because they would be really cute. Thanks for a great site. Hi Kathy. Couple things to double check…when boiling, did you let it boil a full 4 minutes (a good rolling boil)? Also, keeping it in the freezer for at least two hours before rolling into balls. Mine got soft after sitting at room temperature for too long. Once they were coated in caramel and chocolate they kept the shape just fine though. So sorry it didn’t work for you! Feel free to shoot me an email if you’d like to go over it more detailed. I want you to master the technique as well!!!! When I follow the link to the “crunchpack” apples it pulls up apple puree. did you use an apple cut up in pieces, puree or apple sauce? The moisture in the apples will make a difference.